First, you need to make sure you purchase pure, unrefined coconut oil as opposed to refined, which is bleached, deodorized, and stripped of essential nutrients. For the coconut oil hair mask, hair can be either damp or dry, but it works best with damp hair. Scoop out your pure, unrefined coconut oil into a saucepan. Warm it up on low heat for a few minutes, until the oil melts to a clear liquid. Then pour it into a cup or a bowl. Note that the amount of coconut oil used depends on the length and thickness of your hair. Make sure the coconut oil isn’t so hot that it burns your scalp. When the oil reaches the perfect warm temperature, apply it directly to your scalp and massage for a couple minutes. 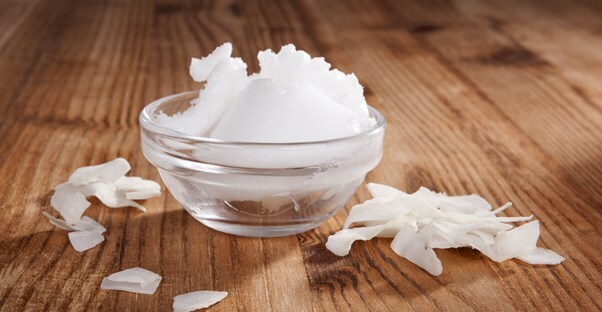 The warmth of the coconut oil will improve your scalp’s circulation, promoting hair growth. After you rub the coconut oil into your scalp, apply the rest of the oil throughout your hair. Work a comb through it to evenly distribute. Shampoo your hair twice to make sure you wash out all of the coconut oil. If you don’t get it all out, you will be left with a greasy residue. For the best results, apply the coconut oil hair mask once or twice a week. Seriously, what can’t you do with coconut oil?